Wassup doc? Just the easiest carrot dish ever. Peeled and chunked-up carrots go right into a baking dish. 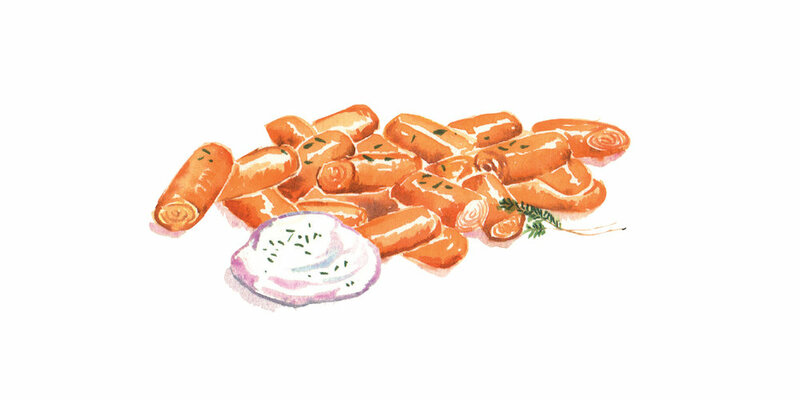 Make it even easier: dump in baby carrots right out of the bag. Toss with a big glug of olive oil and season. Into the oven with these, and 30 minutes later, you have roasted perfection. 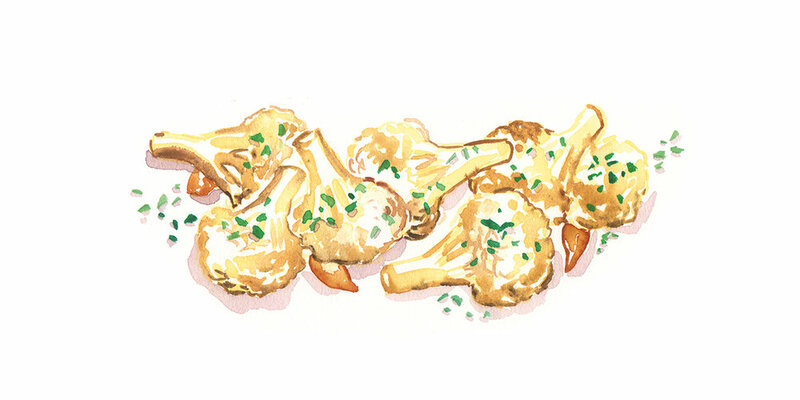 Serve ‘em up with pan juices, a pat of butter, or for fancy-pants carrots, a schmear of crème fraîche and herbs. Bugs Bunny never had it so good. Stop right there. We gotta know right now. Are potatoes okay to eat? Some folks are more sensitive to the extra carbs. If that’s you, skedaddle. Otherwise, a vintage-style prep, with fiber (from skins) and fat (from butter), make these a reasonable treat for most folks. Easy too. Just boil until fork tender—about 20 minutes. Drain. Add butter, salt, and pepper. And butter. A summer classic. Buy yours already shucked or practice patience as you pluck off corn silk. Submerge your cleaned-up cobs in boiling salted water for about 5 minutes. Kinda carby, but you can smother half an ear in butter—or homemade aioli and grated parmesan cheese—and live the dream. Winner of the Ugly Veggie of the Year Award every time, celery root—it’s self-explanatory, folks—is deliciousness in disguise, especially when roasted until crispy and salted to perfection. 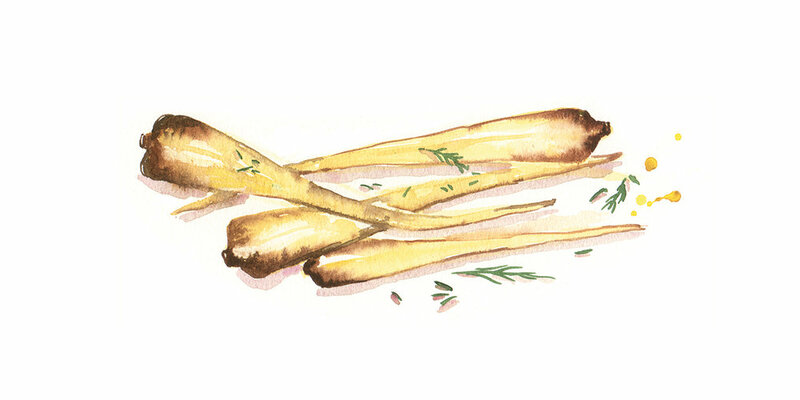 Start by chopping up the root into sticks and tossing with olive oil. Arrange on a baking sheet and bake for 30 minutes. Can’t wait? 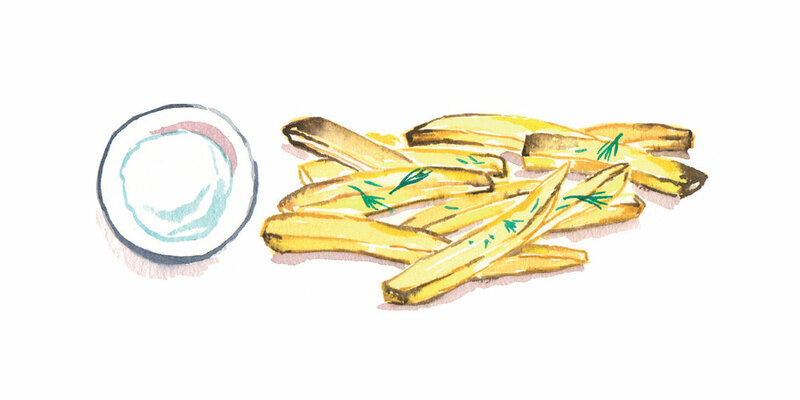 Cut them thinner and pan-fry in olive oil, stovetop, over medium heat. And don’t forget a creamy dip. Does it even taste like celery? Buy some and see for yourself. ~12g net carbs per cup raw celery root. Make any day taste like Thanksgiving with this delicious mash. Give yourself a break—Thanksgiving is a holiday, after all—and buy your squash already cubed. Boil or steam the cubes until fork-tender. Drain off the water and add way more butter than you think you should. It’s okay. Really. Then mash it on up. An immersion blender will make it extra smooth and creamy, but a fork works fine. Did we mention add more butter? For a taste of fall anytime. Cut your squash in half, stem-to-stern, clean out seeds, and cut each half into four wedges. Balance wedges, skin side down, on a baking sheet. Dot with butter. Bake in a hot oven for about 25 minutes. They’re done when edges brown and squash is fork-tender. Serve with more butter, a little salt, maybe a sprinkle of cinnamon. Whatever warms your heart. A parsnip looks like an anemic carrot, but packs a surprising flavor punch. Peel (like carrots), cut in half lengthwise, and coat them with olive oil. Balance your ‘snips, round side down, on baking dish, and roast in a hot oven for about 30 minutes. No need to flip them. They are done when nicely browned and fork tender. Shake on some herbs, salt, and pepper, and knock ‘em out with your mad dinner skills. Okay, we know it’s not rice. But why add a nutritionally wimpy starch to a meal when you can add a vitamin-packed veggie? Grate the cauliflower—or save your knuckles and buy your cauliflower already “riced.” Melt a bunch of butter in a large skillet over medium-high heat. Add your “rice” and stir, sautéing until slightly golden. Like any good love story, you want it tender, but not mushy. Add more butter if needed, plus some chopped herbs. It may not really be rice, but it can still soak up any yummy sauce that comes its way from other dishes on your plate. #freetheeggplant. Get this racy emoji’s namesake out from under all those breadcrumbs and let its own flavor stand out. 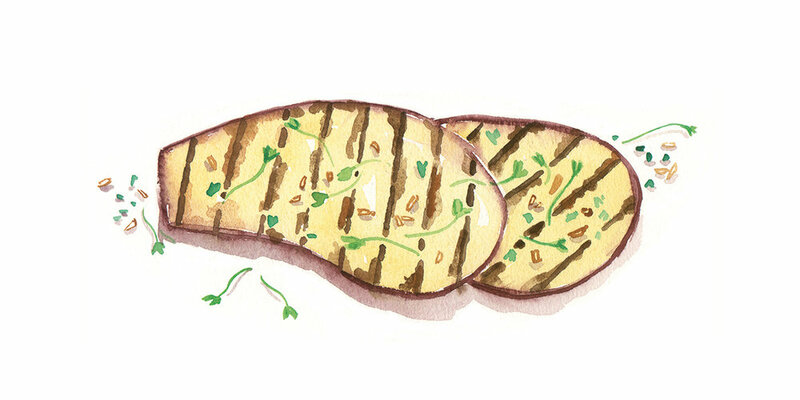 Here’s how: Slice the eggplant lengthwise, salt it all over, and let it bask on some paper towels for a while. Towel off some of the salt and slather on the olive oil. Grill over medium-low heat for about 10 minutes per side (broiling works too); slices should be brown and tender. Splash. Drizzle. Sprinkle. Balsamic vinegar (or white wine vinegar if you are sugar-sensitive) or soy sauce. Olive oil. Herbs. In that order. Satisfying enough to turn anyone into an eggplant lover. Don’t worry about dragon breath; low and slow grilling makes onions sweet, not scary. Peel and slice the bulbs through the equator into half inch thick circles. Dip in olive oil and sprinkle with salt and pepper. Grill over low heat for about 20-30 minutes; a little char is okay. When they’re falling apart, they may not look as pretty but they’ll taste even sweeter. Beautiful and overlooked, fennel is the girl-next-door of veggies. A leisurely cook time banishes the licorice flavor you’ve heard about and brings out the sweetness. Slice the bulbs, top to bottom, into 1⁄2 inch planks, and pan-fry in olive oil over medium-high heat, browning each side. Carefully add a cup of stock or water and turn down the heat. Simmer uncovered; the water will evaporate as the fennel softens. When it’s done, sprinkle on parmesan cheese and cover, allowing the cheese to melt. Serve with a drizzle olive oil, a couple of fennel fronds, and chopped herbs. Fennel, where’ve you been all my life? Cauliflower may be cabbage with a college education, but this recipe is a no-brainer. Rinse the whole thing, cut away the green stuff, and separate the rest into little florets. Toss them on a baking dish with plenty of olive oil and as few—or as many—cloves of garlic as you see fit. Slide into hot oven and roast until brown around the edges and fork tender, about 30 minutes. You can also try swapping out the olive oil for butter and/or cheddar. Smart thinking. Wicked good. Leeks have a sweet, delicate flavor that belies their scallions-on-steroids appearance. They do tend to be a little grubby though, so after you trim off the dark green leaves and the roots, be sure to rinse out the sand from between the layers. Slice the leeks crosswise, on a slight diagonal, and sauté in melted butter over medium heat. 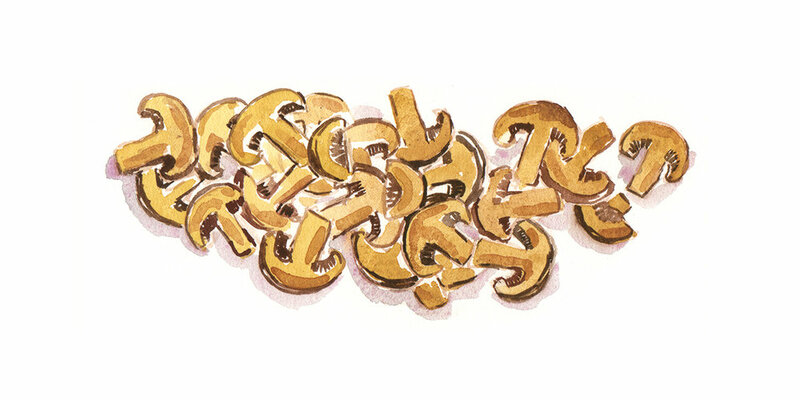 If you flip them carefully, you’ll keep some of the pretty concentric circles intact. Here’s the real witchcraft: When they are soft and beginning to brown, pour some heavy cream over them and cook a few minutes more. Then top with a little shaved parmesan. Magic. Why do we love this dish so much? 1) Because most markets sell pre-cubed butternut. 2) It tastes fabulous. 3) It’s a breeze to make. What’s not to like? 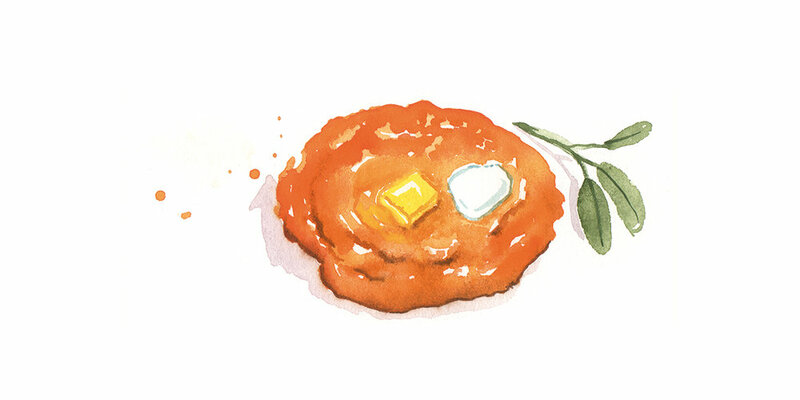 Just toss the cubes of squash with olive oil and arrange on a baking sheet. Sprinkle on the salt and pepper. Roast in a 400°F oven for about 25 minutes. Remove when brown on the edges and fork tender. You could use other winter squashes, although you might have to peel them. And they don’t have “butter” in their names. Fresh baby beets. Sounds like a chillhop playlist for the cool kids, but these babies are hot stuff. Rinse, trim, and chuck them gently into a pot of boiling water. (Or toss them in olive oil and roast them in a hot oven.) Done to perfection is when they are just tender—maybe 20-40 minutes. You can use grown-up beets too, it just takes longer. Either way, serve with plenty of butter, and these beets will be a smash hit. The good ole baked (sweet) potato. It’s not for everyone. Because, sweet. Also: potato. And if the carbs don’t scare you away, the cook time might. You only need about a minute to prep, but you’ll need close to an hour for baking. That said, they’re easy. Just rinse, prick the skin with a fork, and place right on the rack in a 400°F oven with a foil covered baking sheet on the rack below to catch drippings. Do something else for about 30 minutes. Flip the sweet potatoes. Leave for about another 20 minutes, more if the potatoes are larger. Fork-tender = done. Slice in half, lengthwise, and serve with lots of butter on top. Because, butter.